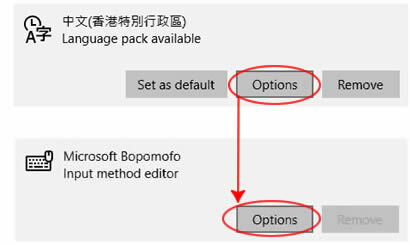 Advanced features ◊ Help files - in English! 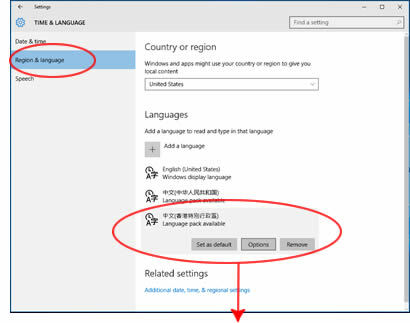 Windows offers a built-in alternative to Microsoft Pinyin, the standard Pinyin input keyboard for Simplified characters, also known as "MSPY". Instead of MSPY in "Chinese, Simplified" setup, some users go elsewhere. 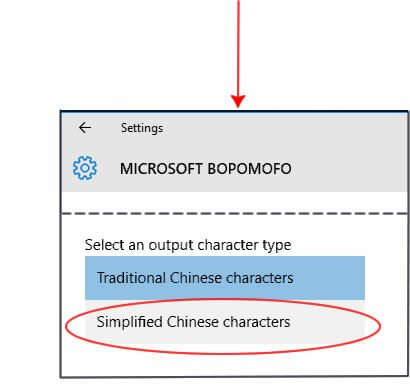 MS Bopomofo, available in the "Chinese, Traditional" region setup, supports Hanyu Pinyin input for both Traditonal and Simplified characters. I've taken to calling this one "MSZY" based on its Chinese name, 微软注音. There are very good reasons why some of you will want to use MSZY instead of MSPY for Simplified characters. You may prefer MSZY's Pinyin input method features, which allows for narrowing down the candidate list by tone number, and displays a larger candidate list when needed. MSZY's rival, the mainland-developed MSPY, is in contrast meant for fast phrase-based input and very little else. And as far as I can tell, in this mode MSZY makes use of the same default SimSun font and mainland China GB-18030 encoding used in in MSPY. There are drawbacks as well. The MSZY IME Pad will be disabled in this mode (although at the Windows 10 launch the MSPY IME Pad was missing entirely), and switching between Simplified and Traditional requires going into Settings each time. Ready to try this? OK, here we go. We begin once again at the Language menu. Open this by first clicking/tapping on the IME icon. In this screen shot, that's the "Bo" for Bopomofo. 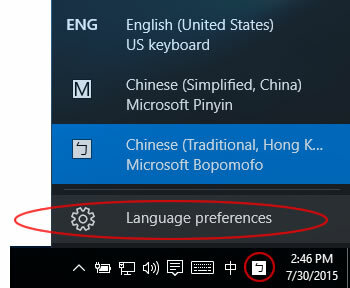 When the menu opens, select "Language preferences". If you're using the desktop language bar (which I show how to setup on the advanced features page), you'll need far fewer clicks to get where we're going. If you look at this screen shot carefully, you'll see that I'm actually already finished: the Chinese/Latin button - third from the left - is a red 简 (jian3) character, and in the Tool Menu the IME Pad is grayed out and disabled. 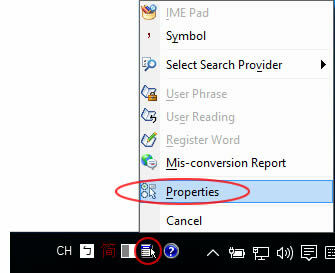 To get the character set selection, open the Tool Menu and select "Properties". That will take you to the classic control panel for this IME. 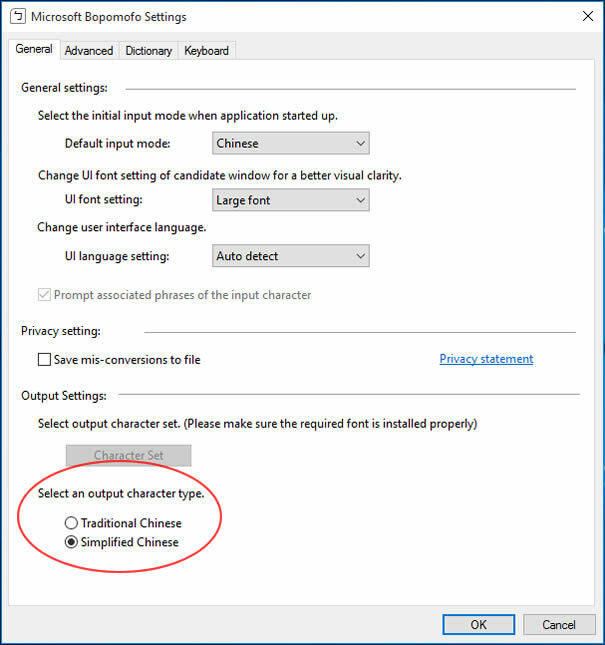 At the bottom of the General tab, under "Select an output character type", choose "Simplified Chinese", then click the "OK" button. OK? That's the basic setup. See the list below for information on "advanced" features like the desktop language bar, the IME Pad, and other features.